Completing a full physical asset audit or asset verification is a project in it’s own right. Completing an audit can be viewed as doing a stock-take. At Assetware we have years of experience in completing physical asset audits for a variety of customers. We work with IT, Finance and Facilities departments to ensure that the assets detailed in the company records and accounts, are those that are actually still in the workplace. The initial consultation focusses upon what is needed. For many of our customers it is the first time that a full asset audit has been completed. It may be that an independent view of the asset register is required. We also work with customers who have tried to complete the task themselves but have found the process more difficult than anticipated. Whatever the reasons that external assistance may be needed we will work alongside your requirements. For an accurate result, it is imperative to ensure that clearly defined areas are audited within a short period of time to minimise asset movements during the audit process. This can mean large teams covering a small area in a very short space of time. This can have an impact on some businesses that is inappropriate to their daily activities, and therefore has to be completed out of operational hours. Equally,some areas have security issues and hold sensitive data or specialist equipment. This may mean that some aspects of an audit have to be scheduled in, with relevant personnel. Where there is an existing data set to be matched against, the requirements need to be clearly identified and discussed. The initial consultation is crucial to create a succesful project and realistic project plan. After the initial consultation a quotation will be provided, and if accepted then a project plan will be devised. A clear and detailed project plan is required to ensure that an audit is completed within the given time-scales. 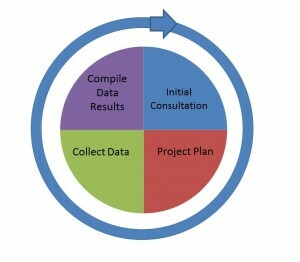 Any project plan is constructed in conjunction within the organisation. This ensures that the audit is conducted in accordance with company requirements and that enough time is provided to gain access to the required areas. Using the relevant number of data collection operatives or ‘Auditors’ the required information is collated using handheld barcode readers. Where Asset tags are not electronically readable the details are keyed in manually. Once the initial data collection is completed, the results are verified by the Assetware Quality Assurance process alongside a member of the organisation that has contracted the work. Some clients simply want an up to date list of their assets, others want to reconcile the information against existing information. The individual client requirements will determine the type of information returned to the client. It is at this stage that any reconciliation to existing data is completed. Regardless of the work required at this point, a full electronic listing of all the gathered asset information is provided to the client. The Asset Audit Service can be broken down into it’s individual components so if it is just the project planning that is required then this can be provided. Likewise if it is just the Audit Kit that is needed then this can be loaned. If you feel that Assetware can help with your asset auditing needs then please call +44(0) 870 112 0700.